Researchers at Surrey have developed the first low-cost sensor which can accurately measure skin friction drag, using off-the-shelf components. The sensor has primarily been designed for the aerospace sector since overcoming skin friction drag accounts for around 50 per cent of fuel burn on a commercial airliner in cruise conditions. Another potential application is in long pipelines where the power needed to pump substances through is entirely expended on overcoming friction. The new 'artificial whisker' technology has been developed by Dr. David Birch of the Department of Mechanical Engineering Sciences in collaboration with Dr. Paul Nathan of Surrey Sensors Ltd, visiting student Xiaozhi Kong (Northwestern Polytechnical University, China) and temporary secondment student Arthur Poulain (ENSTA ParisTech, France). The technology has been developed by repurposing a £10 Honeywell pressure sensor die, creating a sensor which measures less than a millimetre. As well as being much lower cost than prototypes currently available, it offers exceptional sensitivity. The device is sensitive to forces down to about 2 nano-Newtons – equivalent to the change in weight of a piece of tissue paper if a human hair is used to punch a hole in it. Acting like a subminiature joystick, the sensor features pillars which are sensitive to both the magnitude and direction of applied loads, returning a force applied either forward or sideways. The system has been successfully tested in Surrey's EnFlo wind tunnel. Dr. Birch commented: "To date there has never been a reliable method for directly measuring skin friction drag, except for using one-off experimental prototypes which require seven-figure budgets. The high-sensitivity sensor we have developed costs around £20 and offers an accurate, cost-effective solution." In addition to applications in fluid measurement, the sensor could also be used in robotics and haptics (mechanical simulation of touch). 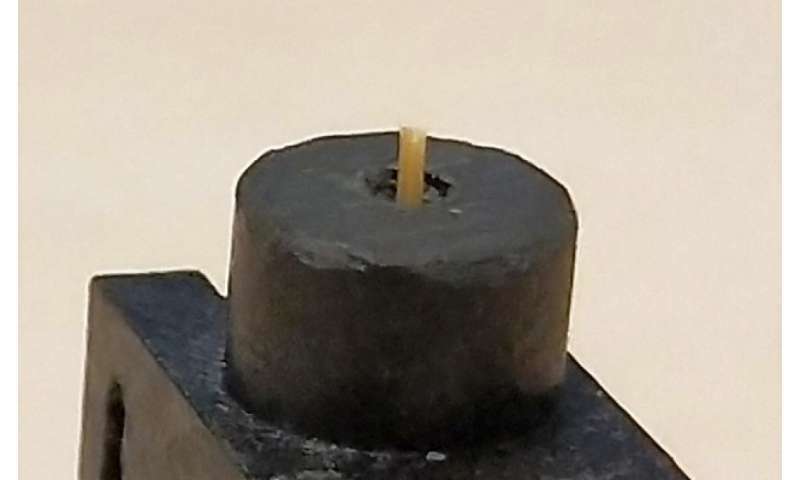 Can a magnet bend a ray of light?